16 Years is a long time to wait for something. Nobody waits 16 years for anything unless we’re talking about some underwhelming time capsule buried years ago, and even then thinking about someone waiting 16 years for a time capsule to open sounds incredibly pathetic. But Star Wars fans waited patiently for 16 years from Return of the Jedi to The Phantom Menace. The disdain and disappointment for the prequels is well-documented and shared by many people. And now 16 years after The Phantom Menace, Star Wars fans are done waiting for someone other than George Lucas to take the reins of their beloved space saga. While there are a few defenders of the prequels, most people seem to miss one important thing: The Phantom Menace is the best of the bunch. But could you blame anyone for being excited? Not one bit. After all, the original Star Wars trilogy consisted of three great films that became a cultural institution. And George Lucas assembled one hell of a cast for The Phantom Menace. Liam Nesson, Ewan McGregor, Natalie Portman, and Samuel L. Jackson – what could possibly go wrong? Aside from the staggering box office receipts, a lot. Yet when compared to the films that succeeded it, The Phantom Menace is superior in each and every facet. Before getting into where The Phantom Menace falls short, let me explain what makes it better than its peers in the prequels. Unlike the other prequel entries, the film has a contained story with a beginning, middle, and end. Granted, it’s not a very good story, but it’s better than the rest of the trilogy has to offer. More than anything, it’s about the invasion of Naboo with a lengthy diversion into Tatootine. Frankly, all of the story involving Anakin Skywalker feels it was shoehorned in a completely different movie. No wonder the trailer for the film focuses almost entirely on that battle in Naboo. Lucas places too great of a focus on the political ramifications of these events which set forth a chain of events that will lead to the rise of the Empire, which dulls the effect of the parallels between The Phantom Menace and A New Hope. (Both movies featuring a young Skywalker plucked from Tatooine in order to play a key role in these wars of the stars.) The greatest similarity to A New Hope is that The Phantom Menace works (by the standards of the prequels) as a standalone film. There’s one thing present in The Phantom Menace that is all but an illusion in the successive installments – sets. More so than the others, the emphasis on practical effects within Episode I is one of the film’s strongest assets, but it’s the physical sets that matter most compared to its brethren. Whereas Episodes II and III have actors walking on soundstages slathered in green screens with all the surrounding elements added later, The Phantom Menace has actors on real sets with tangible props and textures. This matters because the crafted sets don’t age over time like their digital counterparts, and our eyes are able to tell the difference between the two. These may seem like minor triumphs (and they are), but when speaking about the prequels this is as good as it gets. 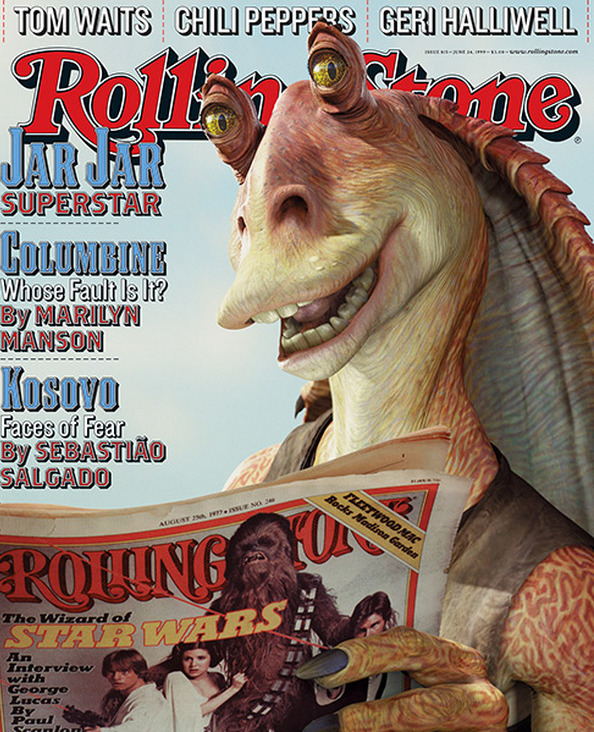 When people complain about The Phantom Menace their thoughts often go to one place – Jar Jar Binks. Of course, the character is a grating presence on screen and fairly racist (more on that later), but to place the onus of the film’s failing on this sole character is entirely misguided. After all, people tolerated an entirely irritating character like C-3PO for an entire trilogy. If we’re looking for a reason why the prequels are underwhelming we should look no further than the villains, a problem that spans across all three films. Think about it: In A New Hope, Darth Vader is instantly revealed as the film’s villain and we’re presented with a crystal clear portrait of good and evil – Leia in virginal white and Vader a towering figure of darkness. In The Phantom Menace, we’re handed a hodgepodge mix of sub-villains lacking in both menacing presence and motivations. The big bad of The Phantom Menace is Darth Maul (performed by Ray Park and briefly voiced by the great Peter Serafinowicz). With his horn-laden head completely tattooed black and red, wielding a double-edged lightsaber, the character is a striking image. But aside from his appearance, what could you actually say about the character? Nothing. Because Lucas gives the villains of The Phantom Menace no depth. Darth Maul’s master – the multi-titled Senator Palpatine, Darth Sidious, or The Emperor – is never given an ounce of motivation besides he’s just evil. Making matters worse, he’s only clearly the villain for those well-versed in the Star Wars mythology. For all intents and purposes, his true nature is withheld to newcomers. Coupled with the battle droids that are never once threating to our heroes, who cut through them like butter, The Phantom Menace lacks villains that feel like a genuine foil to the film’s heroes. In fact, the true villain of The Phantom Menace is the crude racial stereotypes that Lucas litters his film with. It might be most comforting to think that the characters are inspired by lackluster family vacations that Lucas had in the Caribbean and Asia, but even that can’t excuse these disgusting caricatures. Nute Gunray and the Trade Federation are a Borscht Belt act in a science fiction movie, falling just shy of saying “Me so solly.” Meanwhile, the Gungans are just as crude, emphasized by the steel drums that make up their shields on the battlefield and a vocal inflection of imperfect English. Toss in Watto with his elongated nose and greedy demeanor, and you have a film that’s overflowing with overt racism and a tinge of anti-Semitism. Maybe that’s why the morons pushing for a boycott of The Force Awakens over the casting of John Boyega feel invested. If it doesn’t feature crude racial stereotypes, is it really Star Wars? All of these horrible decisions are all the more noticeable because there were so many characters in the original trilogy that spoke an alien dialect translated through subtitles or not translated at all – R2-D2, Chewbacca, Greedo, the Ewoks, and the list goes on and on. Underwhelming villains and overt racism included, The Phantom Menace is still the highwater mark for the Star Wars prequels. After the negative reaction to the film, even though it was a massive financial success and still among the Top 10 highest grossing films at the domestic box office, Lucas took it all a bit too personally, it seems. The subsequent prequels were made as a reaction to the criticisms of The Phantom Menace, purposefully in minimizing Jar Jar Binks and placed a greater focus on action only to still underwhelm, which Lucas took even more personally (his recent interviews only emphasize this view). But we can’t blame the actors for their wooden performances. We can’t blame Jake Lloyd for being a child actor in a thankless role. We can only blame George Lucas because this was the vision of a man who didn’t hear “No” during the entire creative process. It’s his unfettered vision through and through. It turns out the real Phantom Menace was an artist without external limitations. Every artist dreams of it; but when audiences reject it, you can’t put the blame on them.